Activities, places of interest and sight seeing things to see and do locally. Ceredigion is located on the South West Coast of Wales and is almost unknown as a holiday destination and is well worth a visit - you won't be disappointed! With crystal clear waters, beautiful bays, fabulous scenery and views with lots to see and do. About 4 miles away from Nine Oaks’ is the picturesque fishing village of New Quay, with stunning sweeping sandy bays, crystal clear waters, and a busy little harbour. From the Harbour Break Water Dolphins and Seals can seen nearly every day on the change of the tide. That is when it changes from high-to-low water or low-to-high water. Close by, in 2005, Hump Backed whales and a large pod of Dolphins estimated at 1000 strong were seen within 100 yards of the shore! Travelling south for 25 minutes or so, and definitely worth a visit, is the beautiful town of Cardigan with lovely quaint shops and a real sense of history and a recently opened and renovated Castle. Step back in time with Corris Mine Explorers in Mid Wales as you explore the workings of an old Welsh Slate Mine. Take a walk through time through the vast underground caverns of the disused mines and way back to 1836 when the mines were first worked. See the machinery and miners' tools, their candles and even a packet of cigarettes. It feels as if the miners have just gone with lots of things they left behind still in place. Rheidol steam Railway Located in Aberystwyth - The Vale of Rheidol Railway one of the great little trains of Wales and carries you through beautiful scenery to Devil’s Bridge falls. Famous waterfalls and lots of great walks and 3 bridges, one atop the other! With a steep walk back up should you walk down through the Gorge. Boat Trips in New Quay: Click Here for details of the various boats and Scenic boat trips and on the look out for seals and Dolphins. Ever been down a “Gold Mine?” Check out the Dolaucothi gold mine. The Dolaucothi Gold Mines, also known as the Ogofau Gold Mine, are ancient Roman surface and underground mines located in the valley of the River Cothi, near Pumsaint, Carmarthenshire, Wales. Note:- Dogs are allowed on the walks but not inside the mine tunnels. Here you can try panning for Welsh gold in a Roman Mine. Checkout the website for more details! This one's for the kids: King arthur's Labyrinth A mystical tour through tunnels and caves. The search for Alternative Technologies, check out the Center for Alternative Technology at Corris near Machynlleth  all you need to know for a green lifestyle. About 45 minutes away northwards. Europe's leading Eco-center for Alternative Technology has something for everyone. Besides Technology there are some amazing views of Snowdonia! The local National Trust site at Llanerchaeron is less than 10 minutes away near to Aberaeron - with beautiful gardens and National Trust Mansion. Local 18th century Welsh gentry estate. With a Geodesic Dome, just right for inclement days, the National Botanical Garden of Wales. Located a few miles past Carmarthen, with beautiful gardens and plants and a large indoor area underneath a huge glass dome similar to the Eden Centre in Cornwall. At Dre-fach Felindre, Carmarthenshire  find out about the Welsh woollen industry and its history. Between Aberystwyth and Llangurig at Nant yr Arian  where you can watch the majestic red kites being fed from the visitor center. Red Kites are frequently seen overhead at Nine Oaks along with Buzzards too. Not far away from Nine Oaks is the Cors Caron wetland near Tregaron  an important nature reserve, with plenty of bird watching and walks. Also, not far away from Nine Oaks you will find Tyglyn walled garden at Ciliau Aeron  a secret garden, peaceful and refreshing - good playground too! At Aberystwyth University, a first class Theatre and definitely worth a visit. There are too many events to list individually. Check their Web Site for the latest details, films, shows and events. Local and fascinating world of the Honeybee and ants. On-site Shop ~ Tea Rooms ~ Meadery. Coastal walk from New Quay to Cwmtydu . A walk of about 4 miles through old smugglers haunts and deep valley's to the pebble beach where Seals come ashore to have their pups each autumn. 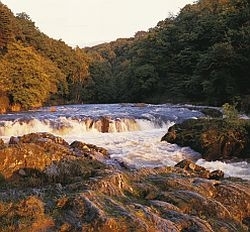 If you're lucky you can see Leaping Salmon and Trout at the beautiful Cenarth Falls. About 25 minutes away with peaceful walks, water falls, salmon leap and coracle centre. A few miles from the Fishery, in a northerly direction, is the colourful and bustling Harbour Town of Aberaeron. Wales' own little "Tobymory" with coloured Victorian houses where everyone has painted them a different colour. A lovely little harbour with plenty of places to eat and drink and a bustling place to experience. Well worth a visit. Heading towards Pembrokeshire is Oakwood Theme Park. The largest theme park in Wales - about 1 hours drive southwards from the fishery. Not far from Oakwood theme park is Folly Farm. One of the best family adventure parks - about 1 hours drive away. Not far away is the International Welsh Cob Center. Derwen Stud International Welsh Cob center, home of fine equine horses cobs, the most beautiful and versatile horse in the world. About 1 hour away. Nearby is the lovely bay and sandy beach of Llangranog. Right is another view of Llangranog, a beautiful little cove with a lovely sandy beach and great for the kids to go surfing with a body board. Car Parking and a Beach side Cafe' literally yards from the waves. About 15 minutes drive away. See Dolphins, Seals, Birds almost every day and lots more on the Coastal Farm 200 yards from the sea. Nine Oaks is a great base for a walking holiday. There are miles of footpaths and registered walks around the fishery to explore. Plus a stroll around the site, which is particularly beautiful, where there are plenty of birds and wild-life to see. Red kites and Buzzards are a common sight overhead and plenty of Finches, Woodpecker's, Tree Creepers and other birds can be seen daily. The fishery is close to the Aeron Valley route from Aberaeron to Lampeter and the Ceredigon coastal path which encompasses dramatic cliffs, sandy bays, fantastic views and wildlife. Coarse Fishing and Trout Fishing available on-site. Nine Oaks was voted in 2006 by "Improve your Coarse Fishing Magazine" as one of the top 6 Fisheries in the U.K for surface fishing for Carp. Star Gazing - with almost no light pollution here, on clear cloudless nights especially when there's no moon, watching the night sky can be fantastic. With the naked eye you are able to see satellites as they sail silently overhead without “blinking”. Meteorites and other sky objects zipping along, all definitely worth while watching! See the Milky Way “cloud” and the myriad of stars not normally seen - absolutely fantastic!